Crunchy toffee-topped crème brûlée meets summer fruits in this elegant make-ahead dessert. 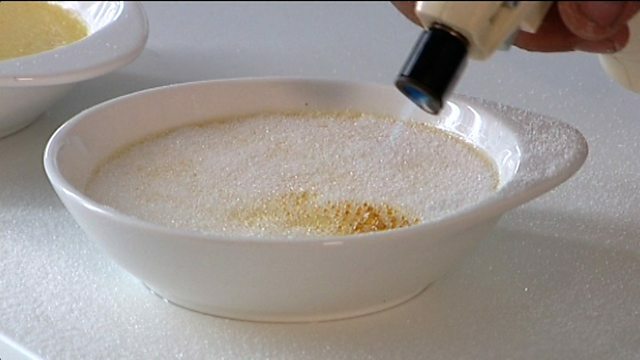 For the crème brûlées, place the egg yolks into a bowl with the sugar and mix together until well combined. Place the milk into a pan and bring to the boil with the vanilla pods and seeds. Pour the milk into the bowl with the egg mixture and mix well. Add the cold cream, cover, then leave to infuse for 12 hours. Preheat the oven to 100C/200F/Gas ½. Remove the vanilla pods and divide the mixture among eight ramekins, filling each one to just below the rim. Place the ramekins onto a baking sheet, transfer to the oven and bake for approximately an hour, or until set. Remove from the oven and leave to cool. For the marinated summer fruits, wash the fruits and leave to drain in a colander. Place a large handful of the fruit into a bowl with caster sugar, to taste, and mash with a fork. Gently stir in the remaining fruit and the chopped mint and leave to stand for five minutes. Taste and add a little more sugar if the fruit is too sharp. To serve, place the crème brûlées onto serving plates with a spoonful of marinated fruits.